There’s nothing for you to do! No, no. This is from me to you. NO STRINGS ATTACHED! The thing is, I’ve been so lucky. I have been nominated for several awards by some of my new blogger friends. I have not participated because, well, as much as I am honored and pleased as punch, no political affiliation intended, I kind of think they are a little repetitive. OK. There. I said it. Please!!!! Take no offense. Here’s my thinking on the subject of awards. I believe the MAIN REASON for nominating people is to circulate blogs and bloggers, and what better way, really, than to nominate, pingback, acknowledge, and get it all out there. I will try to make this short and sweet. Short because I know we all have so much on our plates, work, home, kids, grand kids, reading blogs, reading books, writing blogs, writing books…But I am grateful to all of you for SHARING your ART, your PHOTOGRAPHY, your STORIES, your FAMILIES, your LIVES. To my long-time friend, Genevieve. I can’t thank you enough. Gen is a writer. Her book, Keep Your Ear On The Ball, is a must read book for children, as well as adults. A quick line or two from the book: All of Davey’s classmates are dying to help him. “Let me open that.” “Do you want to hold my hand?” But Davey has one answer for everybody, “Thanks, but no thanks.” Davey is blind. Click on the book to go to Gen’s ‘author’ page. Click here to read her blog. Click here to order her book. You’ll be happy you did. Gen awarded me this: and this: Gen, man. You ROCK! To Gerry, I want to say thank you for all your sharing. Gerry is on a mission to find Missing People. He is a writer, a musician, a poet, and a groovy kind of guy. (if you don’t believe me, check him out). Just click on the award. Gerry nominated me for this: This fits me to a ‘T’. I am the Queen of Commenting. To Cathy G., Many thanks. You do lots of very interesting and creative Family posts. Your crocheted creations are also fun to view. And you’re right in there when it comes to challenges. Cathy nominated me for this: I love the name of this award. It makes me smile. Cathy G. also nominated me for this: You can read about this award by clicking on the award itself, but it is basically about posting with a commitment to maintaining integrity, good manners and behavior, as well as exhibiting a rich sense of humor. Thank you, Cathy. I try. :-). TheRetiringSort, Thanks for the nominations. It took me a while, and it’s not exactly the customary response, but the thanks are heartfelt. TRS nominated me for this: And this: I am truly honored for this one. I never thought of me or my blog as inspiring. This really tickled me. :-). She is a fabulous photographer with a fantastic sense of humor, and she has a flare for the written word. Sharechair is an iPad, Kindle, and iPhone enthusiast. Need I say more? A woman after my own heart. Sharechair nominated me for this: Now doesn’t that have a lovely ring to it? 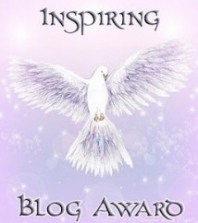 George-b also nominated me for the One Lovely Blog Award. I don’t even know where to start with George. He is a master at blogging. He’s into music – he’s turned me on to Leonard Cohen. If you haven’t heard of him, check him out on YouTube. George is all about art and artists, history and current events. A most interesting gentleman. Thank you, George. For the nomination and the plethora of posts. Happy bicycling :-). Well, I said it was going to be short and sweet. Guess I missed the boat on that one. The following are people in the bloggisphere that I, ah, follow. I spend a lot of time checking these blogs out and if I were paid for my time, I’d be a millionaire. But, ya know what? I’ve been made richer, in other ways, because of them. To all of those that nominated me – if y’all got this far, I thank you. IF YOU FIND AN ERROR OR WISH TO BE TAKEN OFF THIS LIST, PLEASE LET ME KNOW AND I’LL EDIT ACCORDINGLY. :-). IF I OMITTED ANYONE, MY APOLOGIES. :-(. P.S. I know that one of the requirements for accepting awards is that the nominee answer a number of questions. If there’s anything you really need (not!) to know or are curious about, just ask. I think I’ve made this short and sweet enough. :-). That’s what I wanted to do – pass it forward 🙂 From me to you. Thanks, Cathy. WOW! That is the longest post I ever read all the way to the end! Thanks for the buggy bug-eyed award. I will display it proudly (It’s not like I’m afraid of bugs or anything…*shiver*). Also thanks for the shout-out about my book, and the long list of blogs to visit. Always something new on the horizon! My pleasure. I love ALL your stories. And thanks for displaying my Gratitiude Award. I worked hard on that ;-). Gemma, thank you for a characterization of me that makes me feel beyond my own recognition…I’m impressed by your wonderful and inspired word, and cheerfulness of your post. I’m glad to have been able to bring something you found useful, valuable, enlightening, emotional to your world, yes I’m referring to the L. Cohen: I’m happy that you found his meaning too and hope that with your inspiration others will as well: We all can learn from his resolve. Have a pleasant evening, and be ready for another Friday! I’ll be biking this weekend, and hope to make it memorable and share something with you and the rest of our friends! George, you are beyond sweet and inspirational. I love the idea, “NO STRINGS ATTACHED GRATITUDE AWARD.” Beautiful and inspiring. No pressures, just pure joy in the recognition. With all my heart, I do appreciate each award but unfortunately I don’t have much time to make a post for each and I’d been having a hard time placing the award on my side bar due to my poor computer skills. Today, I wish to thank you and all my blogger friends for their generosity. You guys inspire me everyday. God bless. P.S. Congratulations. You have blog that brings light to others. Thank you much for your kind words. I really enjoy this blogging experience and it’s people like you – your stories, family, and pix are amazing – that make it grand. And me, yours. Right on, man! Thank you for the mention on my blog, it is much appreacted, I really like how you did this post. Thank you for this! I don’t know why I’m so late …. Somehow I missed this back in August. Oh my! I know what you mean about the awards. It’s the SPIRIT that is important, and you certainly took it to a whole new level. 🙂 Thank you, muchly. Hey you 😀 An early Xmas present for you…..
Oh, I like this idea! And I agree they are repetitive. You are precious 🙂 Thanks, Jo.